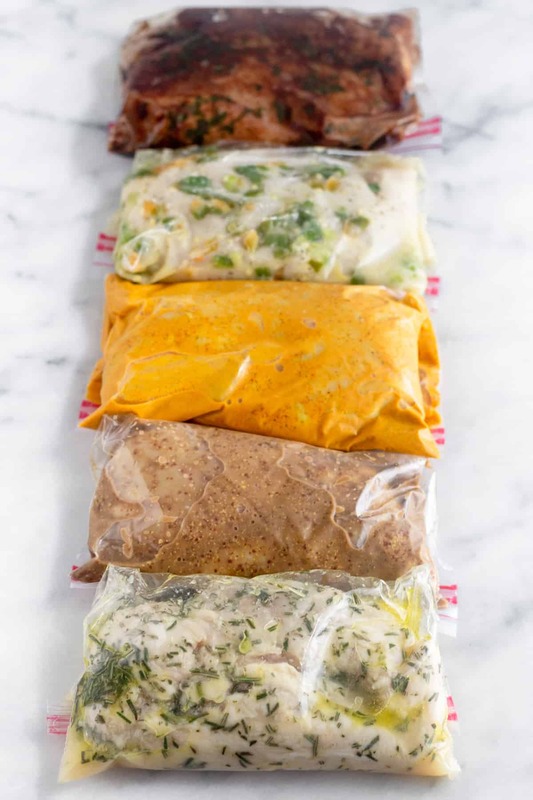 Easy and flavorful Whole30 Chicken Marinade 5 different ways! 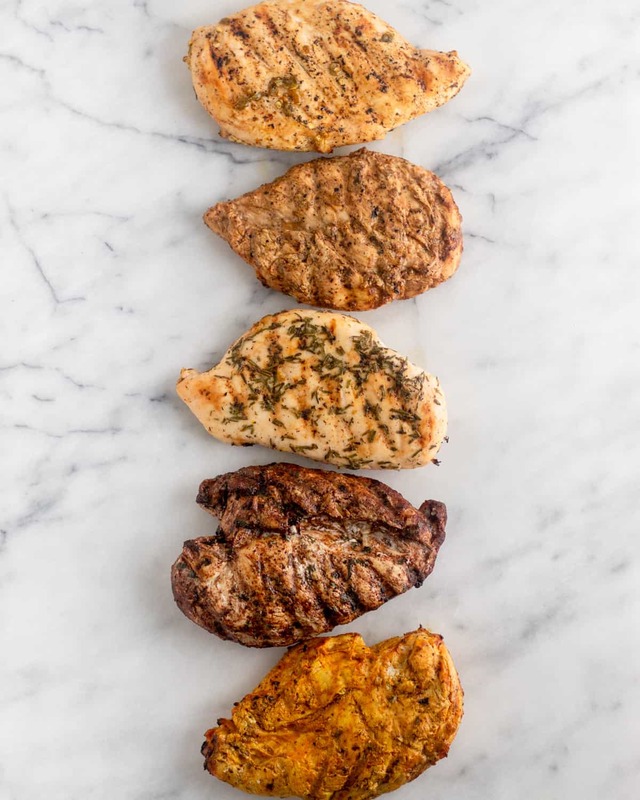 These chicken marinades are perfect for grilling, baking, or pan frying and are paleo, gluten free, dairy free, and Whole30 approved. Say no to boring chicken!! Chicken is a staple in our house. I kid you not, I make it every single week. It’s just so easy and cheap, especially when Michael and I eat a decent amount of protein each day. 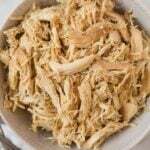 I usually throw some chicken breasts in the crockpot for easy shredded chicken, but now that it’s summer, it’s officially grilling season. And that means easy grilled chicken to the rescue. I’ll admit I don’t know too much about grilling. For the longest time we had a charcoal grill and I honestly didn’t want to be bothered with it. I had to figure out the coals, heat then up, and then spread them out, blah blah. I’m sure it’s not that hard to do, but it just seemed like a pain. Well we recently were gifted a Traeger grill and times have changed. I’m all over that thing..it makes grilling so so easy. All you need to do is make sure you have wood chips in the feeder, turn it on, and turn the knob to the temperature you want. I love it and now I’m grilling all the time. 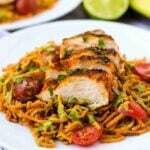 So I figured I would bring you some fun ways to spice up your typical grilled chicken! 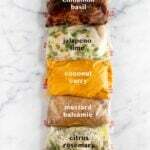 Each marinade only has a handful of ingredients and I’m guessing the ingredients are things you already have on hand. 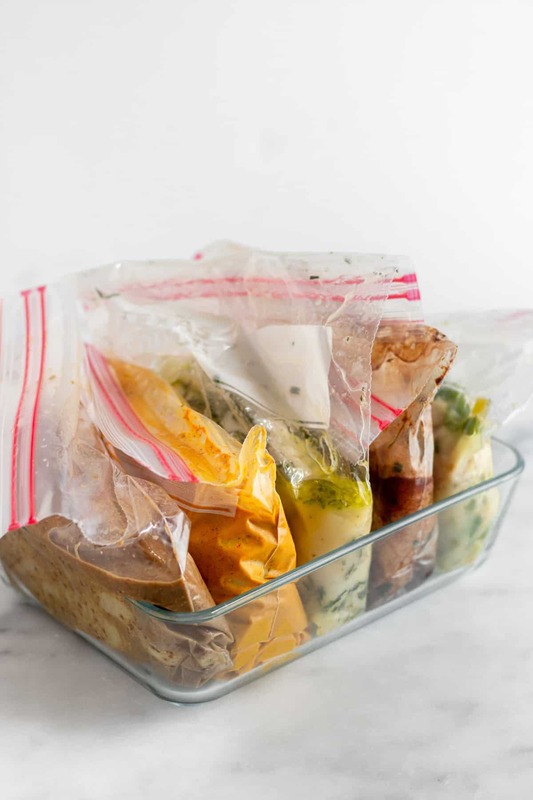 All you need to do is mix up the ingredients, throw it in a plastic bag or sealable dish with your chicken of choice (I used breasts), and let it sit for 4-24 hours. 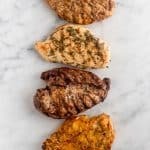 I’ve tested these recipes a couple times and I can’t decide which marinade flavor I like the most. The first time it was the cinnamon basil (trust on this flavor comb), but then the next it was the jalapeño lime. But I really really like the mustard balsamic too. I believe my dad liked the citrus rosemary. Mikey liked the jalapeño lime. Honesty you can’t go wrong with any of them! Whole30 Chicken Marinades will bring flavor back to your chicken and the end result will be super juicy chicken! 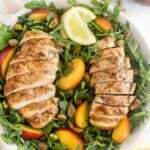 I opted to grill my chicken since it is summer, but these marinades can be used all year around for pan frying or baking chicken as well. They make a great addition to your weekly meal prep as well! In a small bowl, mix together your marinade. Add it to a plastic bag or sealable dish with chicken. You can use breasts, thighs, or drumsticks, any kind will work. Marinate overnight or for at least 4 hours. Grill chicken, bake in the oven, or pan fry. Cooking instructions will vary on cooking method and type of chicken used. 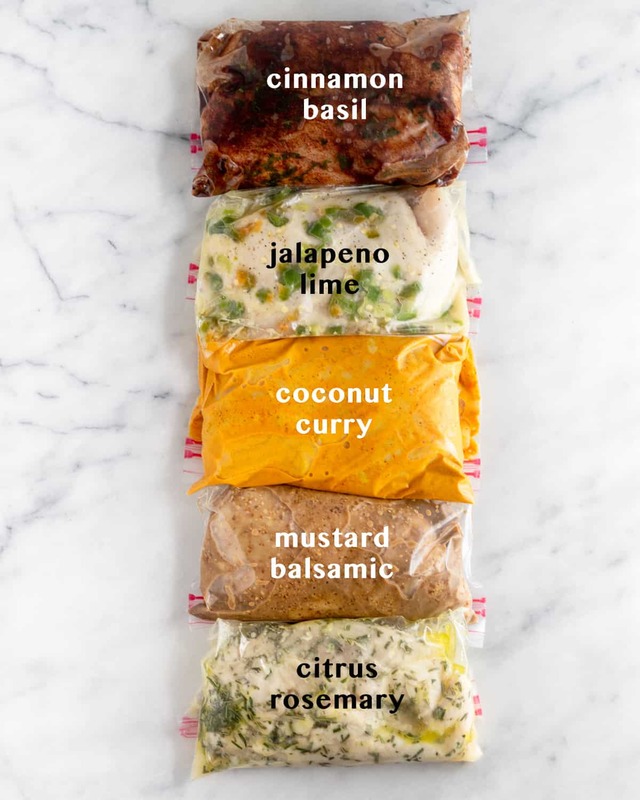 Each marinade is good for about a pound of chicken. If making more, the recipes can easily be doubled or tripled. 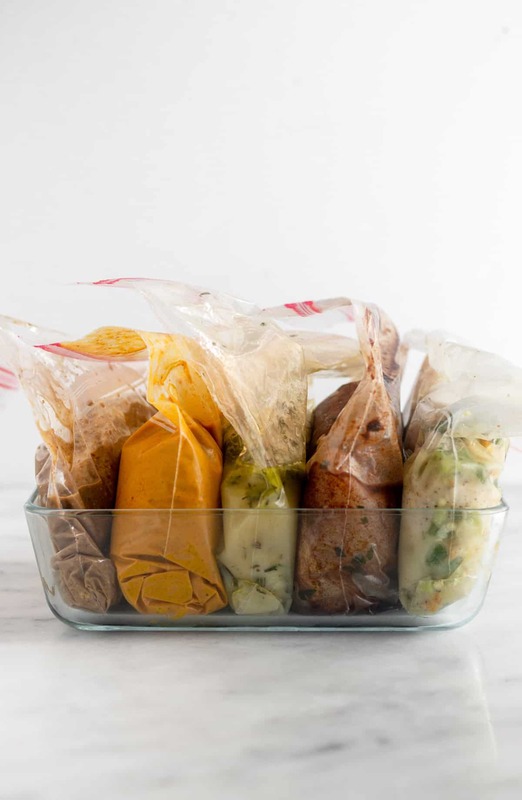 Can you freeze the chicken in the marinade and use at a later date? They sound great! Thank you! Yes for sure! They would be great to prep ahead and then just pull out of the freezer the night before you would like to make it! What do you usually pair the cinnamon basil chicken with? That sounds intriguing!! Well, I’m weird and will eat just about any combo of food, but I usually pair it with whatever veggies and carbs we are having. 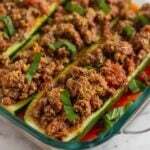 Would go great with some cauliflower rice, green beans, carrot fries, roasted potatoes. Anything! How long and what temperature do you bake the chicken in the oven? Hi Jacqueline! It depends on how thick your chicken breasts are, but I would would say a 5-6 ounce chicken breast takes about 20 minutes in the oven at 400 degrees. The thicker the breasts are, the longer it will take though. If you have a meat thermometer, you want the temperature to get to 165 Fahrenheit. Hope that helps and let me know if you try one! 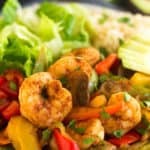 WHat would be good to serve with the coconut chicken curry? Do you throw away the marinade after use… and not use it as a sauce? I do! Since it’s been sitting in the chicken so long, I don’t want to risk it. But you could definitely make a little extra and not put it in the bag/container and use it as a sauce afterwards! Hi Leah! Yes for sure! I would just freeze in bags and then place in the fridge the night before you want to use it. Hope you enjoy! 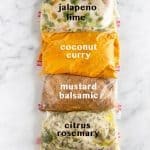 The coconut curry marinade looks great! If I make it with a cut up whole chicken, would you know how to cook it in the oven? What temperature, how long, covered or uncovered? Hey Erica! Yes, that would work great – I would cook at for an hour or so at 375 degrees. Hope you enjoy! I want to make these as gifts for people. What’s the best way to preserve them in jars? I’m new to canning! Hi Kelli! So sorry for the delay! Think that would work. I have actually never tried canning, but from what I have seen, if you just seal them tightly they should be fine (unless I am mistaking on how it works). It’s a great gift idea though, let me know if you try it!! I made the jalapeño lime & the coconut curry marinades in preparation for my #JanuaryWhole30! 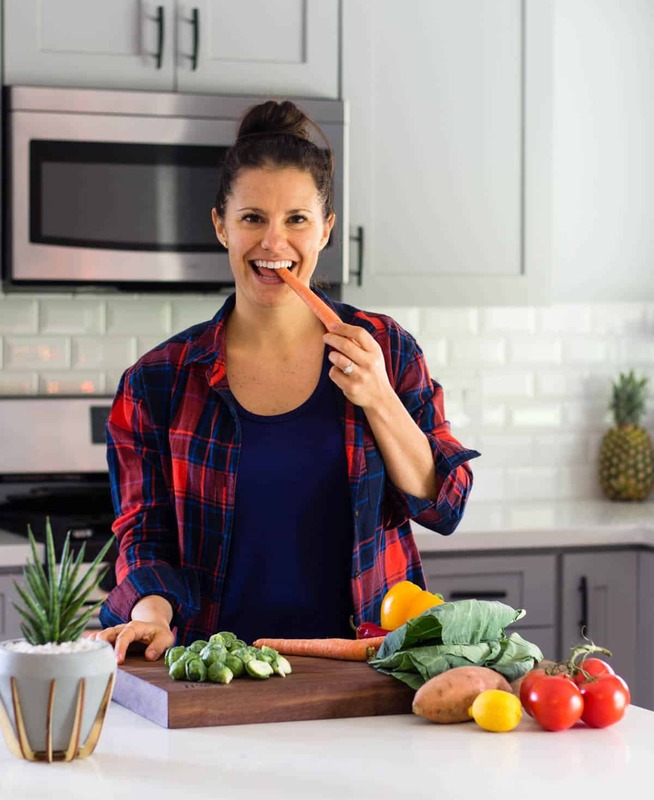 Super easy and super quick prep— I tripled the recipe so I could freeze a big batch to grab & go throughout the month! I would definitely recommend! Such a great idea that you tripled it! Glad you liked them Claire, thanks for trying! Hi! Do you think the cinnamon basil would be good on a turkey loin? Or would another flavor be better? Could they be cooked in the slow cooker? I think that would be good, but also the citrus rosemary would be delicious! Most of them go well on white meats that tend to need more flavor (chicken, turkey…). I haven’t tried int the crockpot, but think it will work okay! Just marinate before and then you can even cook it in the juices! Hope that helps! Just wondering how drastically different these recipes would end up if I used coconut oil rather than avocado oil? Looking at specifically the mustard marinade. Thanks got the help! Hi! I used avocado since when it is chilled, it doesn’t harden. The coconut oil will become solid in the fridge, making the marinade not as liquid and able to coat the chicken. From a flavor aspect, I don’t think it will change that much, might just add a little coconut flavor. For the mustard one, there is so little, you could probably just surpass it or could even use olive oil. Hope that helps! !